In reading old reports of cross-breeding, I have found various cases of attempted crosses producing offspring that appeared to be exclusively maternal, except for an odd trait or two that seems to have been taken from the pollen parent. Sometimes the only apparent influence is an increase in vigor associated with a reduction or increase in fertility. In some cases the subsequent generations revert entirely to the maternal parent. In others, some novel characteristics arise. Some of the breeders of these exceptional crosses have dismissed them, or were at least doubtful as to what actually happened. The more devout Mendelianists have rejected these cases because they conflict with theory. Of course, modern investigations have revealed that wider crosses do not always behave the same way as crosses between parents differing in only a few "unit characters". Chromosome remodeling can occur. In some cases, most or all of the DNA from one parent may be expelled, leaving only traces. These may be called "partial hybrids", and can give the appearance of being second or third generation back-crosses to the dominating parent. I do not assume that all such cases involve the same mechanism. For now, I will list some cases I have found for comparison. P. Grieve, Culford, Bury St. Edmunds. Influence of Foreign Pollen on the Progeny of Plants.—In a previous letter to you on this subject, in your issue of May 26, p. 699, I said that the flowering of the seedling plants of Geranium pratense, which had exhibited variegation in their leaves, would be watched with considerable interest. Most of them are now in flower, and I herewith enclose blooms for your inspection, and although the variegation in the foliage has in some of them nearly disappeared, still this tendency to variegation, combined with the colour of the blooms produced by these plants, will, I think, to some extent substantiate the correctness of my theory, viz., that the progeny of plants may be influenced by the application of the pollen of other species between which and the seed-bearing plants there may not exist that degree of affinity considered necessary to warrant the expectation of the production of a true cross or hybrid, which should partake in a nearly equal ratio of the properties of each parent. As stated in my former letter the pollen of Zonal Pelargoniums with variegated foliage was exclusively used upon the blooms of Geranium pratense, assuming that, should the condition of variegation be in any degree found in the progeny of the latter plants, this might be considered as an earnest of the Pelargonium pollen having had an effect. Variegation certainly has appeared in the foliage of these plants, but whether this may be of a permanent character or otherwise, remains to be proved. And the colour of the flowers is a reddish violet, or just what might have been expected as the result of mingling scarlet with the pale blue colour of the blooms of Geranium pratense. In your note appended to my former letter you say, "The appearance of the leaves sent was such as to justify the inference that a true cross had been effected." The colour of the blooms will also, I think, tend to strengthen this opinion. But, on the other hand, the seedling plants do not in any other respect deviate from the normal condition—the habit of growth, form, and dimensions of leaves and flowers being precisely the same as in the ordinary form of Geranium pratense, and the flowers have at present all the appearance of producing fertile seed. So that should the condition of sterility be accepted as the test of hybridity, the plants in question will fail to be considered as hybrids, and if so, it may be difficult to say what they are. But should it be admitted that the progeny of plants may be occasionally influenced or affected by the application of pollen from species only distantly allied to them, even after the flowers of such plants may have been fertilised by their own pollen, this will then go far to account for the appearance of sports or abnormal productions which so frequently present themselves in the various families of plants, and to account for which no satisfactory cause appears to have been as yet assigned. In 1902 Bailey was the first to produce a viable F1 generation from the Japanese 'Crookneck' (Cucurbita mixta) x 'Connecticut Field Pumpkin' (C. pepo) combination. The 88 F1 plants were phenotypically more similar to the C. pepo species, the only difference being in the state of development of the lower flowers of the plants. The reported breeder, Halfdan Lem, did not publish an account of this alleged hybrid, first described by Pierce (1974). 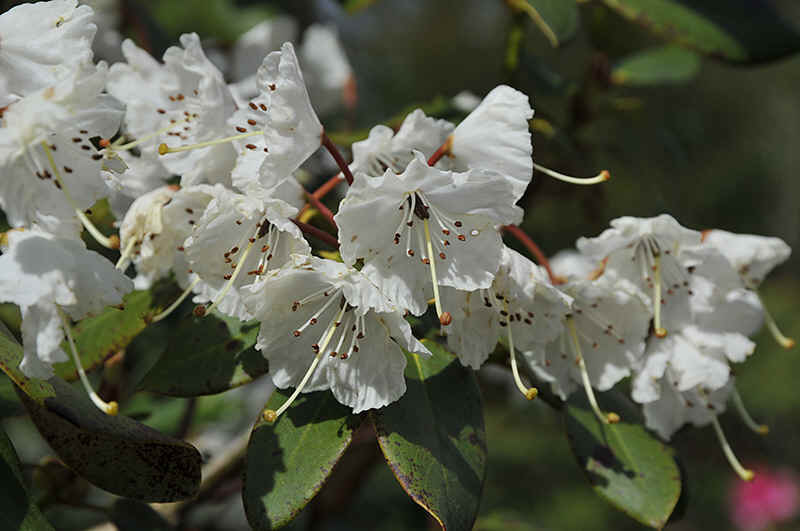 DNA tests by Grant (2004) revealed that the plant was merely R. williamsianum; "The evidence suggests that this, like ʻEverlastingʼ, is a chance mutant of a Rhododendron." However, he does not explain how such a mutation could alter the form of the flower, induce sterility and make the plant bloom for a long season. It is interesting to note that Amateis (1961) raised "a cross of kalmia latifolia x kalmia angustifolia. The result was angustifolia, pure and simple. This was not a case of apomixy, for latifolia was the seed parent. In other words, latifolia accepted foreign pollen, produced viable seeds yet had no influence on the progeny. As this cross is sterile, further development has been impossible." M. MARTIN CAHUZAC has sent to the editor of the Semaine Horticole six flowers said to be the result of a cross between a Chrysanthemum and a Dahlia. The evidence of hybridisation does not appear to have been very marked. A week or two ago, Mr. E. J. LOWE sent us flowers of a cross between a Sunflower and a Dahlia; the flowers were those of a Dahlia, but the central disc was proportionately larger and deeper. Improbable as such crosses appear, it would be rash to assert that they are not possible. Very often the application of the foreign pollen seems to induce enhanced growth of the seedling without actual change of form having taken place. I have already said how one can obtain variations, but in spite of good crossing it often happens that the first and second generations of seedlings have no (or very little) new blood in them. Such seedlings similar only to the type have been abandoned, given up, or destroyed. It is an error to do this because the variations may eventually result from a very slight—almost unnoticeable—change of the type. One must have patience, as the seed of the third and fourth future generations obtained from these plants may unexpectedly give the desired change. Some years sgo I fertilised a Vallota flower with pollen of the Belladonna Lily, and got a good pod of seeds, from which I raised about 100 seedlings. Of these nearly ninety were the ordinary scarlet, like the parent, and I threw them away. Two of the others were a pale scarlet, and I have them now; nine others were of the colour [cerise] of those you saw at Carclew, but varying a little in shade and quality. I subsequently fertilised one of the seedlings with the Belladonna again, and only got a weakly pod containing three seeds, two of which grew, but they were much the same as the seed-bearing parent. The seedlings resemble the Vallota in not being deciduous—in fact, the only difference noticeable is the thicker necks of the bulbs and the variation in colour. Hippecoris Garfieldii is the result of a cross I made in 1932 at the Garfield Park Conservatory between a red Hippeastrum hybrid and Lycoris aurea. The object in view was to create a hardier form of the amaryllis since Lycoris may be grown outside as far north as Ohio. This cross was made reciprocally and seedlings of both crosses started to bloom 19 months from date of sowing. Amaryllis Belladonna x Lycoris aurea gives a plant generally like A. Belladonna: the flowers are smaller and have the wavy divisions of perianth of a Lycoris, but not to the same extent. This flower—which looks rather too much like a typical Amaryllis belladonna variety for this hybridist's comfort!—is actually from seed of Lycoris aurea—or what was sold as Lycoris aurea about 1980—following a pollination of the Lycoris with pollen indeed from Amaryllis belladonna. The plant waited some fifteen years before blooming for the first time; shown is its first bud. The plant shows very little of its mother's influence. The scape and subfloral spathulate bracts are tinged purple, as in the Belladonna. I have recently been successful in flowering plants of Hippeastrum x Vallota. They are exceedingly useful and like a miniature scarlet Hippeastrum, the Vallota parent being more pronounced in the habit of growth. The flowers of these hybrids have not shown much variation in colour, the most remarkable being some of pure white. Mr. Guttridge has made repeated attempts at the Botanic Gardens to effect a cross between some of the garden forms of Hippeastrum and Crinum Powelli, and the plant illustrated was raised from seed obtained from a flower which had been thus pollinated. It is entirely different in appearance, writes Mr. Guttridge, to any form of Hippeastrum in the whole of the collection, which numbers some 2,000 plants. On an inspection of the flower it appeared to us likely that although an effective cross had probably not been obtained, the nodding appearance of the flowers seemed to indicate that the Crinum pollen had at least some influence on the Hippeastrum. In this experiment I hybridized the horticultural pole-bean, or "wren's egg," with the lima bean. It proved exceedingly difficult to make this cross, but after many fruitless efforts I at last succeeded in securing a single pod containing four sound beans by using the pollen of the lima on the pistil of the horticultural bean. When these beans were planted, in the summer of 1872, a very strange result was observed—the beans themselves had in all respects the form, size, and appearance of the horticultural bean, but when their sprouts broke ground it was at once observed that the upper part of their cotyledons (varying from one-quarter to three-quarters of their length in different specimens) were indubitably those of the lima bean; while the lower part of each cotyledon was precisely that of the horticultural pole-bean. These parts were connected with serrated edges, which at last separated, allowing the lima bean part to drop away. Such separation, however, did not occur until the vines had made a foot or more of growth. The cotyledons on each side were divided uniformly in every case. Thus the influence of the pollenizing parent was very markedly shown in the young vines from the moment of their appearance. But after the cotyledons had fallen, all evidence of the paternal parentage of the plants disappeared. The vines did, indeed, show unusual vigor throughout the season, this, of course, suggesting their hybridity. But as to the appearance and characteristics in general, with this exception, they were essentially horticultural pole-beans like their maternal parent. The experiment was carried on for several succeeding generations, but the progeny showed no reversion to the traits of the lima bean. The characteristics of the pole-bean had seemingly been prepotent or dominant to an overwhelming degree. Gustafsson (1944) reported on his Rosa canina x rugosa hybrids. One of the seedlings showed no trace of the pollen parent (rugosa), but was not entirely maternal. The meiosis was abnormal, as in other such hybrids, and Gustafsson found that the plant was missing one chromosome. After somatic cell fusion between soya and tobacco, Kao (1977) selected cell lines in which the presence of tobacco characters could be proved using cytological and isoenzymatic analyses even after several years, despite the fact that the [tobacco] chromosomes were lost. This alleged cross was reportedly one of the first daylilies to have a purplish eye zone (presumably derived from the purple-flowered H. ventricosa). Furthermore, some of the second or third generation progeny had leaves up to 2 inches wide. The cross was reportedly duplicated with similar results. I experimented with several Gesneraceae, especially with Gloxinia (Sinningia), Tydaea, Isoloma, Naegelia, and Lietzia. Notwithstanding known affinities of some Gesneraceae, I was unable to reconcile Gloxinia (as the female) with any of the others, although by pollinating Isoloma with Gloxinia I produced some seedlings with almost regular and round-spotted flowers which were absolutely sterile and pollenless. Moreover, these seedlings carried a great number of multi-petaled flowers having the same number of segments (7) as their putative male parent (the Gloxinia) had. Still, I never regarded these as hybrids, because these characters only appeared in a very small percentage of the seedlings, the majority being apparently pure Isolomas. In 1930 I described briefly a case of hybridity in which apparently there had been a union between an egg cell of Fragaria vesca L. (n=7) from Hawaii and a single genom (n =7) of Fragaria virginiana Duchesne (n =28) from the eastern part of the United States. The variety of F. vesca used as the female parent had white fruit. This plant was isolated in a room containing no other plants and was pollinated with pollen from a plant of F. virginiana having red fruit. Several hybrids were obtained having 35 chromosomes. They resembled F. virginiana. One plant only was found which had 14 chromosomes. Any strawberry specialist would have said that it was a plant of F. vesca, for it had all the major characteristics of this species. (In my preliminary paper, I stated that this plant resembled F. vesca in every respect, and then contradicted myself by saying that it showed "several other characteristics of F. virginiana." The phrase was "minor characteristics" in the manuscript, but the word "minor" was left out by mistake. I had not, at that time, noted the margin difference in the middle leaflet.) The differences noted were red fruits (not a specific distinction), rootstocks slightly stouter, and leaflets slightly firmer and darker in color (as in F. virginiana) but not beyond the limits of variation of other varieties of F. vesca. It was also found that the center leaflet was dentate only halfway to the petiolule—as is characteristic of the variety of F. virginiana used—instead of being dentate for three-fourths of the distance, as in the maternal variety. Noodle Squash: When the flowers of a runnerless bush squash (Curcurbita pepo) were fertilized with pollen from an early-ripening melon with vegetative period of fifty days, most of the setting fruit developed for forty-fifty days, but then their growth ceased and after a short time they spoiled and rotted without reaching complete maturity and proper seed formation; only rare specimens, apparently deviating in their nature entirely in the direction of the squash, attained maturity normally, kept until midwinter, and produced germinable seeds. There were no marked changes in the structure of the flesh or, particularly, in the appearance of the seedlings the following year—only that the flesh was of somewhat softer texture and more sweetish flavour. Since the fertilized flowers had been meticulously castrated at a suitably early date, and since after pollenation they had been guarded carefully against the entry of squash pollen, one necessarily suspected that these fruits were the result of parthenogenetic development of the egg cell; but when the second, third and fourth generations of the hybrids were raised, fertilization with melon pollen being repeated each year, the number of fruits attaining full development increased considerably, and the whole flesh layer assumed the form of noodlelike strings spiralling down the fruit; these string-skeins unwind easily, starting at the top of the fruit, going down and ending at the top again. In dried form, these strings keep well and are very palatable in soup or as a vegetable with roasts. The fruit has a firm outer rind three millimetres thick. I append a photograph of a vertical section of such a fruit, with the whole structure of this noodle squash clearly visible. Here I find it appropriate to state, that despite the general belief in the difficulty of crossing plants belong to different species—and more so—in different genera, I have lately obtained quite a number of interspecific hybrids and a few cases, although rather doubtful ones, of intergeneric hybrids. The latter may have been obtained without the fusion of the parent gametes but as the result of the direct influence of the fecundating source (the pollen) on parts of the maternal plant other than the egg cell, thus calling forth the parthenogenetic development of the latter. As to the degree in which the genes of the parents are transmitted to the hybrids, my observations have led me to believe that not only does the individual vigour of each plant type play an important role, but also that the age of each plant and the age of the species as a whole are of significance. Thus, the greater the stretch of time that a given species has been existing in its place of origin under similar soil and climatic conditions, the greater will the degree of hereditary transmission be which the individual plants belonging to this species possess. Furthermore, the older the plant chosen as a progenitor, the greater is the force with which it transmits its genes to the offspring, and conversely, if the plant is young, in its first years of bearing, and particularly if it is a hybrid of recent origin, its hereditary power reaches a minimum. Even artificial weakening such as preliminary transplantation or excessive drying of one of the parent plants lead to the reduction of this power. I have crossed Lilium Szovitsianum to Lilium Thunbergianum (elegans), the yellow flowers of the first having been pollinated by the pollen collected from the scarlet flowers of the latter. The several hundred hybrid specimens both of the first and of the second generation derived from this cross were plants that could hardly be distinguished from Lilium Szovitsianum. They had leaves of the same shape as those of L. Szovitsianum, the arrangement of the leaves on the stem was the same, and the flowers were the same—yellow and somewhat drooping, the only differences observable in but a few second-generation individuals being a somewhat darker colour of the anthers and the almost doubled height of the specimens as compared to L. Szovitsianum plants. The third hybrid generation obtained by selfing on the whole was like the first two generations with the exception of a few individuals that showed various deviations. The most notable among these was a specimen that had a unique and a quite new flower colour. Its flowers had a glossy, bright purple colour that later gradually changed to a light-brown tint. The anthers and the pollen were black, which is absolutely unusual in the Liliaceae family; the fragrance of the flowers resembled very much that of orchids; for this reason I have given this new variety the name of Fialkovaya Lilia [Orchid Lily]. Besides, it was found on replanting the bulb of this lily that there was an umbellate compact collar encircling the stem at the level of the upper border line of the bulb segments formed by accrete adventitious stem-roots. This collar offered a splendid protection for the bulb against rainwater and extraneous bodies getting inside. This umbrella being closely contiguous to the upper ends of the external surface of the bulb scales is of especial value as a protective screen preventing the penetration into the bulb of insect pests that usually creep down the stalk and thus get into the bulb where they deposit their eggs. The larvae of these insects in most cases cause great damage to the bulbs resulting in their rotting and subsequent rapid death. ... it was understood to have been a true hybrid between the annual white Sweet Pea and the perennial Lord Anson's Blue, now almost lost to cultivation. It was the outcome of a series of experiments made with the object of raising a real blue flowered variety by Col. Trevor Clarke of Daventry. McNeil recorded that he had crossed pollen of Crinum poweiii onto a Clivia miniata plant. He must have been disappointed that the plant looked just like a clivia because he self-pollinated C. miniata 'Four Marys' hoping to see some segregation of Crinum characteristics in the second generation. Unfortunately, the next generation of seedlings showed only clivia characteristics. Speaking of "hybrid" potatoes, the following bit of experience may interest the reader. An attempt was made to cross the tomato upon the potato. This failed. Pollen from the alkekengi, or strawberry tomato, was then applied to the pistils of the potato flower, and one seed ball was the result. Several seeds were planted, four of which sprouted and grew. The plants resembled potatoes in all ways save two: they did not blossom, and in the fall it was found, upon digging them up carefully, that not a tuber, nor the sign of one, had formed. Some of them, when they bloomed, seemed almost counterparts of the South American parent except that their petals recurved like those of the California lily. Some were spotted like the California parent, and some were quite without spots. As a rule, however, these hybrids, even though producing fairly abundant foliage, did not blossom at all, and at best they were small and insignificant, and within a year or two most of them had disappeared. They seemed to produce inferior bulbs that could not withstand the winter. In one case where he crossed two thorn apples (Datura stramonium with pollen of D. ceratocaula), the capsule thus fertilized remained very small and produced but few seeds, of which many were imperfect and almost all failed to germinate the next spring. Of about sixty apparently good seeds, only three grew, and from these two plants were grown to maturity. These plants were exactly like the mother plant, but were nevertheless abnormal, because of their unusual height, being nearly twice that of the mother species, and also in dropping all the flowers produced in the lower forks. Such increased vigor and partial sterility were observed by Naudin in all intermediate hybrids of Datura, but in this case the plant resulting from the cross showed no trace of the characters of the father species, and its seeds, when planted the following year, yielded the ordinary form of the mother plant. The external conditions are able to affect the yield and the quality of the lint of the hybrids through the coherence of characters described in the previous chapter. The hybrids which resemble only the Egyptian parent in its unacclimatized form and fail to show any definite Kekchi or Upland characters or any improvement of lint have all been found under conditions favoring the development of the tall, erect form in Egyptian plants. In a planting at Coachella, Cal., in 1908, Mr. T. H. Kearney found that the hybrids resembled the pure Egyptian plants much more closely than at Yuma or at Sacaton, Ariz. Neither by the habits of growth nor by the more detailed differences, such as the form and color of the bolls, could the hybrids be recognized with the same readiness as in the Arizona plantings. Where the external conditions favor the Egyptian habit of growth it is possible to find plants, even in the second generation of hybrids, that show only Egyptian features either in the vegetative parts of the plant or in the seeds and lint. Careful study of such a plant was made at Del Rio, Tex., without finding any of the signs of hybridity which had been very apparent in the parent of this particular plant and had been carefully noted in the preceding year. Other plants in the same row showed many degrees of expression of the Egyptian characters, and there appeared to be a very consistent relation between fertility and superiority of lint, increasing as the non-Egyptian characters came into expression. The conditions of growth were distinctly unfavorable to fertility in Egyptian cotton and the plants appeared to be affected by them to an extent corresponding to the degree of expression of the Egyptian characters. In an adjoining row of Egyptian plants a few individuals that were distinctly more fertile and had better lint than the others also gave distinct evidences of hybridization. Without going into details I may state here that the three roses 'Floradora', 'Käthe Duvigneau', and 'Cinnabar', as well as the hybrid 46534, did not show any traces of the male parent Rosa Roxburghii in their morphology. The first three roses are true hybrid polyanthas, the latter is a true hybrid tea, indicating thus that the genes which are responsible for the respective characters of growth habit and for many characters of shape and size of flowers, fruits, leaves and spines are dominant to the allelic genes of R. Roxburghii. Only anatomical studies revealed a certain similarity and relationship to the latter species. Introgression of Solanum phureja DNA into S. tuberosum dihaploids was analysed by the use of amplified fragment length polymorphism (AFLP) markers. Five dihaploids, derived from crosses between S. tuberosum cv. Pentland Crown and two different S. phureja pollinators (IVP48 and EC90) were investigated by use of 17 AFLP primer pairs. Also 30 dihaploids, derived from pollination of five different S. tuberosum seed parents with S. phureja IVP101, were investigated for the presence of S. phureja-specific markers. In total approximately 680 and 850 AFLP products were detected in the diploid S. phureja clones and in the tetraploid S. tuberosum genotypes, respectively. A total of 68 S. phureja IVP48-specific markers were detected, while the total number of S. phureja IVP101-specific markers was in the range of 72-96, depending on the S. tuberosum seed parent. Introgression of DNA in the S. tuberosum cv. Pentland Crown dihaploids, after pollination with S. phureja IVP48 and S. phureja EC90, was demonstrated by the detection of 14 of 68 IPV48-specific markers in the dihaploids. Assessment of genetic variability of haploids extracted from tetraploid (2n = 4x = 48) Solanum tuberosum. Ercolano MR, Carputo D, Li J, Monti L, Barone A, Frusciante L.
The objectives of this study were to assess the genetic variability of haploids (2n = 2x = 24) extracted from tetraploid Solanum tuberosum through 4x x 2x crosses with Solanum phureja. Molecular and phenotypic analyses were performed to fingerprint the genotypes used and to evaluate their potential use in breeding programs. AFLP analysis revealed the presence of specific bands derived from the tetraploid seed parent S. phureja, as well as ex novo originated bands. On average, 210 bands were visualized per genotype, 149 (70%) of which were common to both parental genotypes. The percentage of S. tuberosum specific bands ranged from 25.1% to 18.6%, with an average of 22%. The fraction of genome coming from S. phureja ranged from 1.9% to 6.5%, with an average value of 4%. The percentage of ex novo bands varied from 1.9% to 9.0%. The presence of S. phureja DNA is very interesting because it indicated that S. phureja pollinator is involved in the mechanism of haploid formation. The characterization for resistance to Erwinia carotovora subsp. carotovora and potato virus X (PVX) provided evidence that haploids may express traits that are lacking in the tetraploids they come from, which can be useful for both genetic studies and breeding purposes. It is noteworthy that genotypes combining resistance to both diseases and good pollen stainability were identified. Other possible breeding implications owing to the presence of S. phureja genome in the haploids analyzed are discussed. Theor. Appl. Genet., 104: 652-660. Hybridisation between the annual diploid sunflower (Helianthus annuus) and the perennial diploid species Helianthus mollis and Helianthus orgyalis was obtained by means of a normal crossing procedure or embryo rescue. Hybridisation success was low. All plants examined cytologically appeared to be diploid. However, the phenotypes of these diploids were not intermediate between the parents and, despite great variation, they resembled the female parent-type predominantly. Thirty five percent of plants issued from sunflower pollinated with perennial Helianthus had a phenotype resembling the female sunflower parent. On average, only 5% of the minimum number of expected RAPD and RFLP bands from male parents were recovered in plants produced from mature seeds after pollination of sunflower by H. mollis. More hybrids were found among plants obtained from embryo rescue, with an average of 25% of the male parent bands recovered per plant. Analysis of individual plants indicated the occurrence of various levels of hybridisation. There was a significant positive correlation between the number of phenotype traits related to hybrid status and the number of bands derived from the male parent. A single hybrid plant might possibly represent the product of a 'normal' hybridisation event. The mechanisms behind these unusual events and the consequences for the breeder are discussed. To obtain introgressed sunflower lines with improved disease resistance, interspecific crosses were performed with foreign perennial species. We report on several unusual features displayed by these hybrid plants. The methods used to produce the kernels affected yield and genotypes of progeny. Phenotypic traits and DNA markers were investigated in 97 plants derived from cross-pollination between annual diploid cultivated sunflower (Helianthus annuus) and the perennial diploid species H. mollis or H. orgyalis, and the reverse reciprocal crosses. The level of hybridization in progeny was determined using RAPD and RFLP markers. Hybridization was performed by leaving embryos to develop normally on the head (classical crossing) or using embryo rescue. All observed plants derived from H. mollis were diploid (2n = 34). Phenotypes were predominantly similar to the female when cultivated sunflower was the female parent. Progeny from crosses using a wild species as the female parent resembled that parent. Thus, reciprocal crosses led to different progeny. F1 sister progeny shared different sets of molecular markers representing a few of those of the wild species used as the pollen donor. Our results indicate mechanisms leading to the unusual event of partial hybridization. Possible mechanisms behind these unusual events and their possible impact on evolution are discussed. I've got ten seedlings from a Rubus odoratus fruit pollinated by 'mutabilis', R. hugonis, and R. rugosa. I have been bouncing back and forth between thinking that they are hybrids and that they are just OP Rubus odoratus. The leaves are very large and maple shaped — very much like their Rubus mother, in deed, so far they look very much like Rubus odoratus in all respects. But I have noticed that the... arg... I can't think of the word. Not sepals... Those little leaf-like fringes right where the leaf attatched to the stem. [stipules] Anyhow, in Rubus odoratus, those are practically non-existant, so tiny one can hardly see them. Roses, of course, have much more pronounced ones, and my seedlings have ones (I wish I could think of the name for them!!) that are decidedly different from their Rubus mother. The new leaves also have strong reddish tints, which the rubus does not. All in all, I am very hopeful that they are indeed hybrids. The proof will be in the flowering, of course, though who knows how long that will be. As far as vigor and all, they have been growing very rapidly, their leaves are very large and utterly disease free, slightly wrinkled and fuzzy. I will let you know as soon as they flower -- I am madly excited about the things, and a flower bud will launch wild rejoicings. The following items do not fit the model of "exceptional" crosses, but I don't know where else to put them. In the autumn of 1839 I thought I would try an experiment on the German stock, for which purpose I took out the centre spike of seed and saved it by itself; the others I also saved separately. When the plants raised from the seeds bloomed, I found that those saved from the centre shoots were nearly all double, while the others were nearly all single. I have also tried several other plans, but never succeeded so well with any as with this. Perhaps to some of your readers it is not new, but to others I trust it may not be altogether useless. Theor Appl Genet (1996) 92: 285-291. An intriguing case of intraspecific variation in the basic amount of nuclear DNA occurs in Helianthus annuus. In this species, significant differences in genome size were found even within the progeny of homozygous plants. It was shown that these genomic changes are established during early embryo development. As a rule, a gradient is observed in which the genome size increases from embryos developing in the middle of the head to those developing at its periphery (Cavallini et al. 1986, 1989). Three fractions of repetitive DNA and the ribosomal cistrons have been shown to be involved, though to different extents, in these alterations of DNA amount, which are able to produce phenotypic variability by affecting certain aspects of plant development (Natali et al. 1993). Theor Appl Genet (1989) 77: 12-16. Previous results suggested that the amount of nuclear DNA varies in one and the same progeny of Helianthus annuus, depending on the head portion in which seeds have developed. Accordingly, cytophotometric determinations were carried out in a selfed line, after Feulgen-staining, to obtain information on the developmental stages at which DNA changes are produced and on the mechanism controlling the variation. It was found that the Feulgen absorption values of mitotic prophases in immature anthers and pistils and of meiotic prophases I are the same in any flower of the head. In contrast, the Feulgen/DNA contents of early prophases in heart-shaped embryos differ significantly, increasing from those developing at the centre of the head to those developing at its periphery, and remaining unchanged in each embryo during further development and seed germination. Variations in the number of chromosomes do not account for the differences observed in nuclear DNA contents in which sequences comprised in heterochromatic nuclear regions are involved. The Feulgen absorption values of seedlings obtained from seeds developed in different portions of single heads increase or diminish starting from those found in the mother plant. This depends on whether these latter are relatively low or high and on the gradient of seed location in the head. The variation occurring within each single progeny covers the whole range existing within the line.